The collapse of the Fifth Ministerial of the World Trade Organization (WTO) in Cancun, Mexico, last Sunday, Sept. 14, was an event of historic proportions. Cancun has several massive implications. First, the collapse represented a victory for people throughout the world, not a "missed opportunity" for a global deal between North and South. Doha was never a "development round." And what little promise it offered for development had been betrayed long before Cancun. Not even the most optimistic developing country came to Cancun expecting some concessions from the big rich countries in the interest of development. Most developing country governments came to Cancun with a defensive stance. The big challenge was not that of forging a historic New Deal but that of preventing the US and the EU from imposing new demands on the developing countries while escaping any multilateral disciplines on their trade regimes. In this regard, it was not the developing countries that brought about the collapse, as US Trade Representative Robert Zoellick implied in his final press conference. That responsibility lies squarely with the United States and Europe. When the second revision of the draft of the ministerial text appeared early on Saturday, September 13, it was clear that the US and the European Union were not willing to make any significant cuts on their high levels of agricultural subsidization even as they continued to intransigently demand that the developing countries bring down their tariffs. It was also clear that the EU and US were determined to disregard the Doha Declaration's stipulation that the explicit consensus of all member states was required to begin negotiations on the "Singapore issues." Negotiate on our terms or not at all: that was the meaning of the second revision. Not surprisingly, developing countries could not lend their consensus to a framework of negotiations so detrimental to their interests. Second, the WTO has been severely damaged. Two collapsed ministerials and one that barely made it-Doha-recommends the institution to no one. For the trade superpowers, it is no longer a viable instrument for imposing their will on others. For the developing countries, membership has not brought protection from abuses by the powerful economies, much less serve as a mechanism of development. This is not to say that the WTO is dead. There will be efforts to bring the WTO back from the brink, like the US and the EU did at Doha. But the likelihood is that, with lack of momentum from a successful ministerial, the machinery will slow down significantly. Zoellick was correct in doubting that the Doha Round will be finished by its deadline of January 2005 and European Union Trade Commissioner Pascal Lamy was simply trying to put a bright face to a bad situation when he said that the WTO had completed 30 per cent of the Doha agenda. Aside from the loss of momentum and the impairment of the basic functioning of the organization's machinery, growing protectionism in the rich countries, a global economy plagued by long-term stagnation, and the unraveling of the Atlantic Alliance owing to political differences do not provide a favorable climate for the WTO's serving as the main mechanism for trade liberalization and globalization. The WTO may eventually suffer the fate it helped inflict on the UNCTAD (United Nations Conference on Trade and Development): surviving but increasingly ineffective and irrelevant. This raises the question: even as we rejoice in the failure of a ministerial that was loaded against the interests of the developing countries, should we welcome the weakening of the WTO? After all, some have argued, the WTO is a set of rules and machinery that, with the appropriate balance of forces, can be invoked to protect the interests of the developing countries. Partisans of this view say that one is better off with the WTO than with the bilateral trade deals that US Trade Representative Robert Zoellick said at his final press conference would now receive Washington's priority after the failure of Cancun. The truth is that this is a false choice. The WTO is not a neutral set of rules, procedures, and institutions that can be used defensively to protect the interests of weaker players. The rules themselves- the main ones being the supremacy of the principle of free trade, most favored nation principle, and the principle of national treatment-institutionalize the current system of global economic inequality. What weapons the weak countries have are few, and far between. The principle of special and differential treatment for developing countries has a very weak status in the WTO. Indeed, in Cancun, the US and the EU completely banished from negotiations the special and differential treatment agenda that had been mandated by the Doha Declaration. The WTO is not a truly multilateral organization. It is a mechanism to perpetuate the US- EU condominium in the global economy. 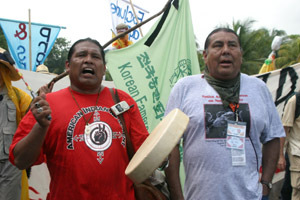 Third, global civil society was a major player in Cancun. Since Seattle, the interaction between civil society and governments on trade issues has intensified. Non-governmental organizations have assisted developing country governments in the political and technical aspects of negotiations. They have mobilized international public opinion against the retrograde stands of rich country governments, as in the drug patents and public health issue. They have emerged as strong domestic coalitions that put their governments' feet to the fire to stiffen them against any further concessions to the rich countries. If many developing country governments resisted pressure from the US and the EU in Cancun, it was because they feared political retribution from civil society groups back home. 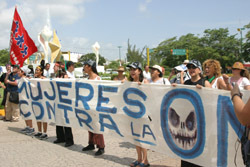 With peoples' movements marching in the city center and NGOs demonstrating hourly inside and outside the convention hall from the opening session on, Cancun became a microcosm of the power of global dynamics of states and civil society. The suicide of Korean farmer Lee Kyung Hae at the police barricades warned everyone at the convention center that they could no longer take the plight of the world's small farmers for granted, and this was acknowledged by the governments with the one-minute moment of silence they observed in his memory. Truly, the collapse of the Cancun ministerial was another confirmation of the New York Times' observation that global civil society is the world's second superpower. Fourth, the Group of 21 is a significant new development that could contribute to altering the global balance of forces. Led by Brazil, India, China, and South Africa, the new grouping stalemated the EU and US drive to make Cancun one more sad episode in the history of underdevelopment. The potential of this group was indicated by Celso Amorin, the Brazilian Trade Minister who has emerged as its spokesman, when he said that it represented over half the world's population and over two-thirds of its farmers. US trade negotiators were right in discerning that the Group of 21 represented a resumption of the South's push for a "new international economic order" in the 1970s. However, much lies in the realm of possibility, and the potential of this new formation must not be overestimated. It is now mainly an alliance focused on radically reducing the subsidies of northern agriculture. And it still has to meaningfully address the desire for comprehensive protection of smaller farmers in the smaller countries that are mainly focused on production for the domestic market. This is understandable since the Group of 21's most vocal members are large agro-exporters, though most have significant domestic-market-oriented, peasant based production as well. Nevertheless, there is no reason that a positive agenda of small- farmer-oriented sustainable agriculture cannot be placed at the center of the group's advocacy. There is also no reason why the Group cannot extend its mandate to forging a common program on industry and services as well. Even more exciting is the possibility that the Group of 21 can serve as the engine of South- South cooperation that goes beyond trade to coordination of policies on investment, capital flows, industrial policy, social policy, environmental policy. Such formations of South-South cooperation centered on the priority of development over trade and markets provide the alternative to both the WTO and the bilateral free trade agreements now being pursued by the US and the EU. In articulating its agenda, the Group of 21 will find a natural ally in global civil society. With the US and the EU determined to defend the status quo, this alliance must be moved from potential to reality as soon as possible. It will not be easy of course. Progressive civil society groupings may be comfortable dealing with the Brazilian government headed by the Workers' Party, but they will be ill at ease with the Indian government, which is fundamentalist and neo-liberal and with the Chinese government, which is authoritarian and neo-liberal. Nevertheless, alliances are forged in practice and no government must be automatically categorized as impossible to win over to the side of people-oriented sustainable development. To conclude, shortly after the Doha Ministerial, a number of civil society organizations said that the interests of the developing world would be best served by derailing the coming ministerial in Cancun instead of trying to convert the ministerial into a forum for reforming the WTO. As Cancun approached, the intransigence of the powerful countries stalemated discussions with the South on almost all fronts. By the time Cancun came around, there was no more talk of reform. Things had become crystal-clear. With the EU and US determined to get their way, no agreement was better than a bad agreement, a failed ministerial was better than a successful one that merely served as one more nail in the coffin of underdevelopment. After Cancun, the challenge for global civil society is to redouble its efforts to dismantle the structures of inequality and to push for alternative arrangements of global economic cooperation that would truly advance the interests of the poor, the marginalized, and the disempowered. Walden Bello is professor of sociology and public administration at the University of the Philippines and executive director of the Bangkok-based research and advocacy organization Focus on the Global South. Sahara and the Sunderbans: Ecotourism or Megatourism?